Would you like to come with me back to 1539? King Henry VIII is in negotiation to marry his fourth wife; Cromwell is at the height of his powers; Princess Mary’s life has never been in more jeopardy as she defies bowing to her father’s will, and the monasteries are crumbling under new reform. Are you ready? Kentwell in Suffolk is your Tudor time machine. 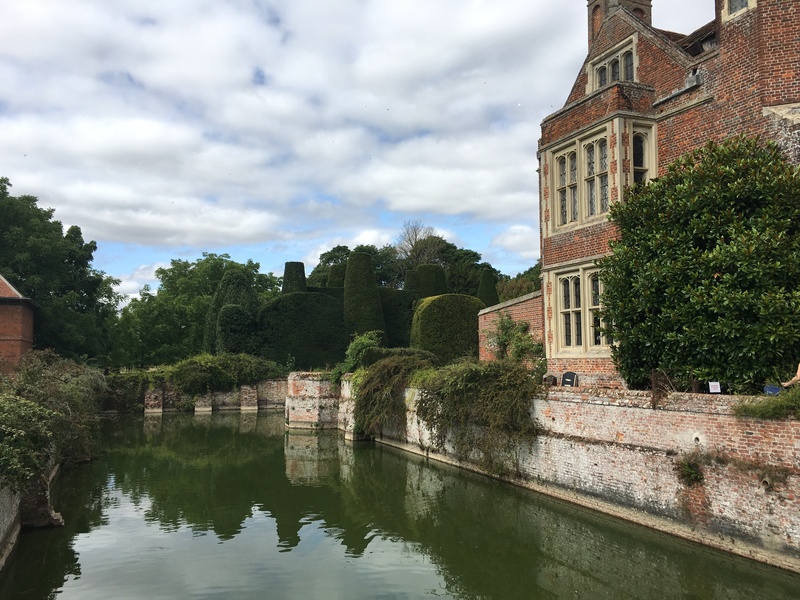 Travel with me as I go in search of not only the Cloptons (the wealthy, mercantile family who own Tudor Kentwell), but also the servants and workers who run the estate – and the travelling tradesmen who ply their passing trade at the house. Join me and meet silk traders, cooks, the housekeeper, scrivener and family members as they go about their everyday lives. Let’s go! As I wander down the path toward the house, my attention is caught by a tent in which two women are busily working. It is an odd sight; something like a cat’s cradle of threads is caught about a post. I approach the woman who is busy working the threads with her fingers; I am curious to know what she is doing. She tells me that they are traders from London and that she is busy weaving silk laces to sell to the gentry. Her companion interjects: “Aye, but in truth, the most important would have aiglets of silver upon the ends of the threads.” Before I can ask more, a gentleman approaches and he catches their eye. “Good day to you, Fred. Are you well?’ The ladies get distracted from their weaving – and from our conversation – and so I slip away quietly, leaving them to their work and their gossip. I cross the moat into the courtyard in front of the house. There, two women, nurse maids perhaps, play with two small children who run about happily in the sunshine, gurgling their delight. I do not interrupt their games, but instead cross the courtyard and head into the house. I enter the house and turn left. Almost immediately, I am thrust into the bustle of the kitchens. It is a hive of activity. Seven or eight people are busy preparing the main meal of the day, dinner, which is to be served at 1 o’clock. The hour is fast approaching, so final preparations are underway. The kitchen is hot and smoky; an array of colourful and aromatic dishes are either already prepared and arranged on the side table, or are still being cooked upon the open stove at the far end of the room. Steam swirls upwards from the pans. Its dancing patterns are illuminated in the light streaming through the large windows which sit above the stove. In front of me, the long, central table is groaning with a variety of ingredients in various stages of preparation, alongside a jumble of ceramic pots, some used and discarded, others still with their contents being stirred or worked by three of the cooks. Over to my right, I notice the brick oven from which baked pastry is being removed. I peer inside a little; the oven is glowing from the heat of the bricks. I catch one of the cooks for a moment and ask what she is baking. She talks to me of a ‘coffin of pastry’, explaining that coffin merely means container. “And what else?” I enquire. “Indeed I have”. Yummy; my tummy is already beginning to rumble, for it is past midday. “Methinks it is many, many years, since I have told you what to do!” There is much laughter. “Aye, tis true, I have a way about myself that I will do as I will!” In front of the cook I see a tray of pies; ‘raised pies’ she tells me. ‘Raised Pies?’ I say, somewhat confused, wondering what filling might give cause for such a name. Cook looks at me as if I must be simple-minded. “As they are raised up.” She points to the sides of the pastry being raised up and pinched about the edges. Of course! “They are made of hot water crust pastry and filled with liver mince I made yester, prunes and ground pig meat.” As a vegetarian, this does not fill me with a desire to eat them, but the pastry looks delicious indeed. I realise how hot I am and that, whilst the smell of the wood fire and baking food is mouth-watering, my eyes are beginning to smart from the smoke. The cooks work on regardless, seemingly oblivious. I suspect after many years of toiling in these conditions, they are used to it. Nevertheless, I take my leave with a rumbling stomach and head toward the great hall. “And where hast thou been?’ The woman who is sitting working the marchpane at the table raises her voice indignantly. “How long does it take to make marchpane! …And who was that young fellow I saw you with…?” I notice her apprentice blushing furiously as she stares at the ground. “Nobody, I mean…” I hear the beginning of her sheepish reply, but no more as I walk on down the corridor toward the hall. Just before I reach the great hall, I can hear sweet Tudor music and singing voices drifting down the corridor to greet me. Before I get there though, I come across a lady repairing a pair of hose in the large antechamber to the hall. I soon find out she is the housekeeper. She is modestly dressed with an English hood upon her head. “As a housekeeper, are you a married lady?” I enquire curiously. “And what are you working on, madame?” I ask. She seems pleased with herself as she inclines her head in reverence before returning to her work. In the same room a woman writes at a desk, her quill in hand surrounded by parchment littered across the dark, oak table. I am curious to know who she is writing to. She explains to me that she is a scrivener [Def: a person who can read and write and would write to the court, or write administrative letters]. “So I need to look out for him in these parts? Mayhap he is someone to avoid?” I don’t like the sound of this character, not only on account of her words, but the look upon her face as she grimaces her displeasure at the very thought of him. I see a list of names written alongside the properties. “Dr Lee will tell you that the coinage which comes from the sale, will go toward protecting the realm. So, indeed, there is no selfishness what-so-ever!” This last word she says with some sarcasm and a raised eyebrow. I well get her meaning! “I only do what I do as it is a necessity…and yet I have a rosary hidden in my bag!” I say no more on the matter and change the subject to safer territory. “Who took it upon themselves to teach you to write, Madame?” I know that whilst female education is becoming more accepted than it once was, not everyone, and certainly not every woman, knows how to write. Beyond the anteroom in which we stand talking, melodious music and sweet singing voices float gently through the house. I take my leave from the scrivener and move on. In the great hall a table is set across one end, clearly being prepared for the gentry’s dinner. At the end of another long, oak table opposite sits a young woman dressed in a black, French gown and hood. She is being taught to write by an older woman who is attired more simply with a linen scarf about her head. At the high end, musicians practice their music, accompanied by three more ladies in fine attire. By their dress and pastime, I gather that they must be part of the family. They mesmerise with their clear, singing voices, whilst another stands separately, engrossed in a book, clearly learning the prose. I listen to their practice for a little while, not wanting to interrupt, before being drawn on by the sound of children playing in the room beyond. Here, seated around the fire are several ladies; by the window, a number of small children play with toys, accompanied by two young maids. “Verily, if you speak with my husband, he will boast that he is to hunt a great stag, but in this landscape I know not where he will find one! In truth, he is more likely to return with a pheasant, or a partridge, or some coney [rabbits] for the table.” More laughter ensues. So how do you normally spend your days, ladies?” I enquire, interested in the life of a country gentlewoman, so far away from court and deep in the Suffolk countryside. “Oh my! There is quite a difference in age! I immediately feel sorry for Elizabeth, clearly having spent so many of her years bearing children. “Well, she had the youngest when she was but 14, he being William, my husband. ” Yikes, I think. Thank goodness that I didn’t have the obligation of raising a child at such a tender age. Just as I am about to ask more, I hear the call for dinner ring out from the great hall. I must take my leave as the family gather themselves to eat. Once again, I make my reverence and slip out the back door. It’s time to return to my twenty-first century life. Plan to stay all day – there is so much to do and get involved with, the time will fly by! Ask lots of questions and throw yourself into the spectacle. All the re-enactors are super friendly and are very visitor oriented. Although they will stay in character (which is what makes the day so much fun), you just be yourself and speak ‘normally’. If you are looking for a fabulous place to stay, full of history and character, both West Stow Hall and The Swan at Lavenham are highly recommended. Thanks Deb, that is great feedback. Much appreciated. It really is must if you love immersing yourself in Tudor history.